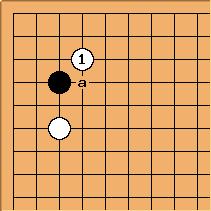 This shoulder play has its uses, but unless Black is strong in the centre it may just be a trick play. See BQM41. 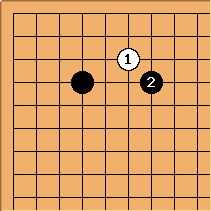 This was seen in an old Go Seigen-Hashimoto Utaro game. It isn't a ridiculous choice, assuming White can handle Black a in reply - see 6-3 point Another oddity in 3-6 point pincers. This strange idea actually goes back a long way, when is at a. 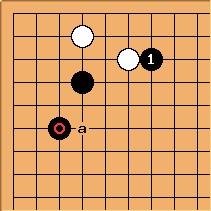 It is only in recent years that variations have been accepted as joseki. See 4-4 point low approach low extension, slide, attach.